Somewhat turned off by the incessant all lower case letters and too-adorable-for-words i.m. speak of one half of this novel, I ran headlong into the speech above and forgave almost everything. If there has ever been a better expression of the sense of futility and dashed hopes experienced by every teenage boy since Cain and Abel, I haven’t read it. 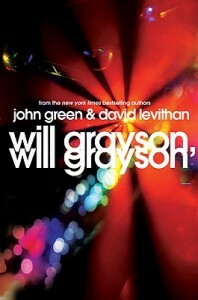 And that’s precisely what makes will grayson, will grayson by David Levithan and John Green, work. Both authors remember with icicle clarity what it was like to be a boy; confused by a larger world that increasingly insists on crashing the party, utterly befuddled by the future, and to make matters worse: falling in love for the first time. Unfortunately, what promised to be an absorbing depiction of two disparate teenage lives, collapsed under the weight of a secondary plot thread and lost its way completely. David Levithan kicks off the story with his Will Grayson, a cool, affluent, music-obsessed, insecure high school junior in Chicago who lives by two simple rules: Shut up, and don’t care too much. In reality he cares a lot, which is why we like him, particularly as he laboriously and almost unwillingly begins his pursuit of Jane, who is just enough like him to attract his desire, and just enough cooler than him to scare him to death. John Green’s Will Grayson, on the other hand, is a blend of knife-edged defensiveness and gloomy feelings so stark his dialog seems to be written in eye-liner and black nail polish. He lives in an entirely different version of Chicago; the one where single moms struggle to pay the rent, and kids with depression don’t have weekly sessions with a shrink. This Will is gay, untried and untested, and madly in love with Isaac, a boy he knows only as an online profile. Under circumstances painful, humiliating, and funny as hell, the two Will Graysons meet. And what a beautiful thing it would have been if that had never happened. At this critical moment, both authors seem to forget what they are writing about, and the novel loses its footing and stumbles to an unfocused, unsatisfying, and almost unrelated conclusion. I blame Tiny Cooper. A lovably infuriating mountain of baby queer, Tiny Cooper is introduced early on as the best friend of Levithan’s Grayson. A mass of self-obsessed neediness, he is like a neurotically insecure actor constantly demanding more lines, and neither author seems to be able to refuse him. He becomes the thread that ties the two Graysons together, and in this role, he manages to hijack the entire story. Its not that he’s an uninteresting character, it’s just that the two Will Graysons are much more interesting. But once Tiny gets his hands into the narrative, these two lead characters become supporting players in a different novel which begins to feed awkwardly constructed plot devices into the abyssal maw of his need for affirmation. The two Will Graysons, their stories all but abandoned, are forced literally into roles as audience member and stage hand, as Tiny drags the plot off to GLEE land, where the Graysons finish out the story by happily accepting their roles as minor planets revolving around the sun that is Tiny Cooper. As speculative as it sounds, having read will grayson, will grayson, I have to conclude that as Tiny Cooper swept leviathan-like through the story, he dragged not only every character into his wake, he even dragged his creators. Dan Cullinane is a freelance writer who lives in NE Tennessee, where he works at a work/study/adventure boarding school and gets paid to hike the Appalachian Trail. His writing has appeared in Frontiers, Publishers Weekly, Red Line Blues and numerous anthologies including Best Gay Love Stories, Leathermen, and the forthcoming Beautiful Boys. You can find him on Facebook at facebook.com/dancullinane. Perhaps Dan Cullinane should not be so critical of the book less he be critiqued in the fallacies of his review for it was not David Levithan who “kicks off” the story at all. The straight Will Grayson is written by the fingertips of Tom Green. Additionally, while I agree with Cullinane’s statement of Will Grayson/Will Grayson, that these characters’ souls are deep and yearn the reader to have the chance to explore them more, Tiny Cooper is an essential character, with a relevant second storyline, since it is Tiny who keeps the two Graysons’ together. Without Tiny, the tale of Will Grayson/Will Grayson would end sadly on a street curb. Hi Cory — Thanks for the correction! I am horrified to discover my error. I had made an assumption based on prior work by David Levithan, and his style seemed more in keeping with the first Will Grayson, however I should have fact checked that and my apologies to the authors. There is no question that Tiny Cooper is relevant to the story, but I stand by my assessment that he took over the story and reduced the Graysons to secondary characters, and I found and find that to be an unfortunate choice, and an unsatisfying way to resolve the characters’ story lines. But I thank you again for your correction, and for your assessment.